One of the most noticeable changes in OS X Lion is Apple’s reversal of traditional page scrolling. In Lion, Apple has adopted an iOS approach to scrolling by changing the way that the user scrolls up and down; instead of moving the window around the content, you actually move the content itself. This method of scrolling works great when you’re on a touchscreen device like an iPhone or iPad, but a more traditional desktop experience doesn’t lend itself to what Apple calls “Natural Scrolling” in Lion. If you’d like to go back to the old way of scrolling in Lion, here’s how to do so. It’s actually quite easy to turn off reversed, or “natural,” scrolling in Lion. All you need to do is change a simple setting in your Mac’s System Preferences. If you’re on a MacBook or desktop machine with a Magic Trackpad or Magic Mouse, it’s as simple as going to the “Trackpad” menu of System Preferences and clicking on “Scroll & Zoom.” From that window, uncheck “Scroll direction: natural.” Reversed scrolling will be disabled. If you’re not using a trackpad or Magic Mouse, you can disable reversed scrolling in your “Mouse” options. Uncheck “Move content in the direction of finger movement when scrolling or navigating” and you’re good to go! The public’s reception of Apple’s scrolling reversal in Lion has been incredibly varied. Some like the change and see it as Apple moving forward with the ‘iOSification’ of OS X, while some see it as an annoying flaw that’s difficult to get comfortable with. On a trackpad, reversed scrolling makes a little more sense. 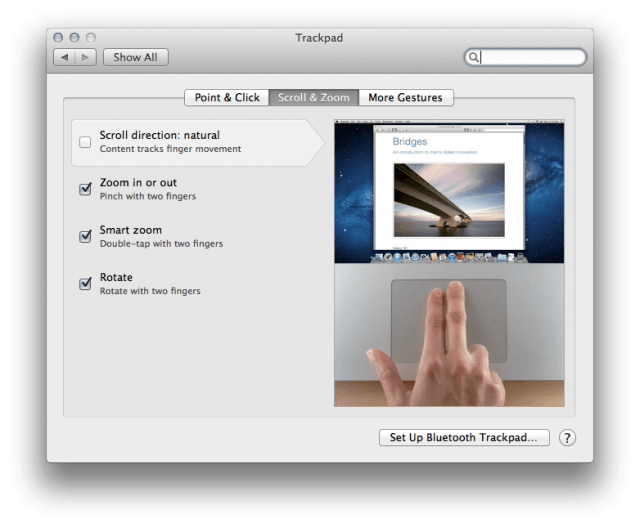 The trackpad is the closest thing to a Mac touchscreen, and scrolling through content feels more akin to scrolling on the iPad or iPhone. However, on a physical mouse — even the Magic Mouse — reversed scrolling in Lion can initially feel very wrong. It definetely takes some getting used to. What’s your opinion of the reversed scrolling in Lion? Did Apple make the right move, or is “Natural Scrolling” on the desktop too premature?